This affordable office space is set in an attractive Grade II listed building in the town centre of South Newbury, just a two-minute walk from the train station that provides a regular service to London Paddington. Offices suitable for up to four people. This property is based in an award winning Newbury business park, already home to a large number of IT, service and distribution companies. Benefits include gardens both in the development's courtyard and canal side, security systems and high speed broadband. The Court's location makes access to the motorway network easy with the M4 just 10 minutes’ away, Heathrow Airport can be reached in around an hour. These light comfortable offices are within a regency period building perfectly set next to Newbury's Town Centre. The location is deal for all road and public transportation links, including Heathrow Airport. 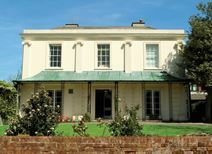 The accommodation retains a period elegance and comes with secretarial, meeting and catering services. This office accommodation is within a business centre that boasts a high quality support service facility including full tailored reception and administrative services. The centre is located in Newbury town centre where there are local amenities and public transport links. The motorway network is not far away via the A34 and the M3 ensuring excellent access to London and Heathrow. Additional facilities include communication technology and car parking offering a full package to support your company's success. This Business Centre is situated in historic Newbury and has been developed to meet the needs of local businesses. It's fabulous location means there are shops, bars and restaurants on the doorstep as well as excellent transport connections for London and the South West. The office space offers a full range of business facilities, including reception services, administrative support and conference facilities, and the option for a support package.